Goals and narratives are perhaps the least appreciated, understood, and often confused components of a residential curriculum. In reviewing the cascade of learning objectives in a curriculum, one starts with an educational priority. An educational priority is a broad summary statement of what students will learn as a result of their participation in the curriculum. This educational priority is then delineated further into a set of (typically 3-4) learning goals and related narratives. Learning goals seek to provide more specific statements of what students will learn in a curriculum. They focus the educational priority into sets of more narrowly defined thematic learning outcomes. Each learning goal also has an accompanying narrative. Narratives are brief paragraphs that define terms and set the philosophy and reasoning behind the choice of learning goal. Learning goals and narratives can be confused, conflated, or ill-defined in practice. When developing these components of your curriculum, if you can develop a focused set of goals and narratives, it will likely make your work significantly easier the further you get into the curriculum planning process. After developing your educational priority, a department or division will settle on a set of learning goals. When developing learning goals, it is important to remember they are statements of student learning. In some of the curriculum plans that schools develop, learning goals are stated as themes as opposed to statements. For example, a department may state that their learning goals are “interpersonal development, citizenship, and diversity and inclusion.” Although these themes may represent the content of the learning goals, they are not, in themselves, learning goals. They do not state what a student will learn or what these “categories” mean in practice. Although these quick shorthand methods may be useful in communicating a curriculum’s focal areas to a broader audience, they should nevertheless be backed up by statements. While this may be shorthanded in discourse to the “Leadership Skills” label, it nevertheless does not replace the learning goal statement. In practice, educational professionals should be utilizing the goal statement as a means of describing what is specifically meant by the term “Leadership Skills.” There can be many definitions as to what this entails. The risk posed by utilizing just the label is that staff may interpret it differently–leading to a disjointed curriculum. The above narrative gives significantly more content beyond what one may glean from just a learning goal statement, and much more than just a learning goal label. Having this narrative can help direct staff in designing more educationally purposive activities with greater focus and consistency. It can also serve the help campus partners understand the goals of a curriculum better. Engaging campus partners in the creation and refinement of goals and narratives can ensure the consistency of the learning experience across campus. The goal of curriculum is not to create an entirely new set of goals devoid of campus context, but one that brings together all of the pieces of the co-curricular experience into a coherent whole. It may also draw on expertise more present outside of your department and insulate a learning goal from being interpreted differently according to the whims and interests of an individual staff member. Goals and their related narratives are key components of the curriculum. They are what provide focus and consistency to your educational plans. They should be constantly reviewed, communicated, and revised. As new staff come in or as you develop partnerships with others, goals and narratives can serve as a means of centering the conversation and your work more squarely on the student learning experience. When developing goals and narratives, don’t be tempted to take short cuts. 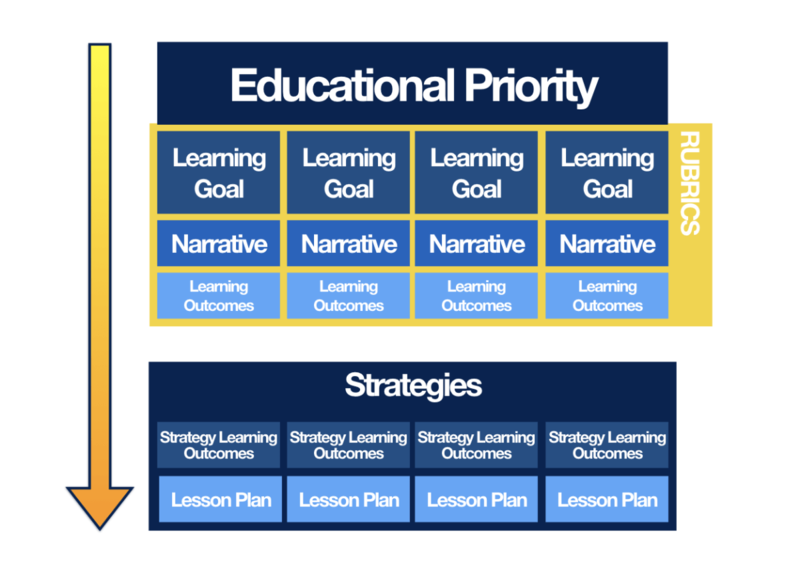 A robust set of goals and narratives is key in developing your curricular framework. Do you have well written and defined learning goal statements? What theories, philosophies, and approaches inform each of your learning goals? Have you developed narratives? Do you share these with internal and external stakeholders and partners?